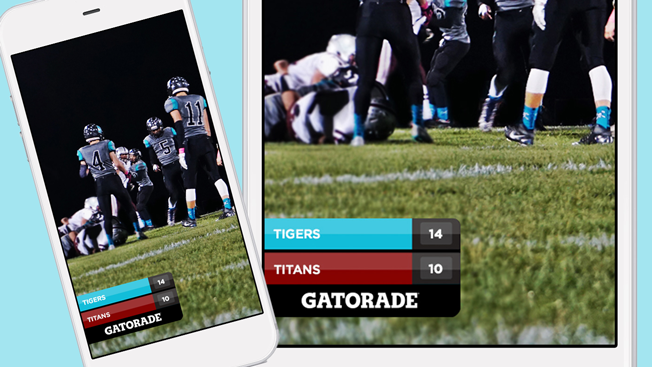 Snapchat has inked a deal with ScoreStream, a platform that crowdsources live sports scores, to power real-time geofilters at high school football games in the U.S. this fall. Snapchat started experimenting with real-time scores for NBA games this year and a handful of other sports, including the NFL, with a feature called Live Score. The location-based technology is now being deployed at thousands of high schools so the app's teenage and millennial users can spruce up their snaps with their teams' scores. The partnership with ScoreStream is the first time the real-time scores will include advertising, and Gatorade has signed on as the program's sponsor for the fall season. Using the geofilter, Snapchat users will able to add a scoreboard decal to photos and videos taken and posted from games. The colors of the filters change based on school colors. Gatorade's messaging appears at the bottom of the graphics. ScoreStream's technology builds on Snapchat's existing geofenced features that wrap specific locations like stadiums to access special graphics. The app expanded its 2-year-old geofilter feature earlier this year to let anyone create their own designs starting at $5 each. "Attendance at high school sporting events is two-and-a-half times greater than all pro sports combined, yet there has never been a comprehensive source for real-time high school sports content, until now," Derrick Oien, ScoreStream's founder and CEO, said in a statement. "Offering our crowd-sourced, hyper-local sports content to Snapchat's unrivaled audience of millennials marks a sea change in how local sports will be consumed going forward."